The World’s Best Selling Verb Book-- and with good reason! 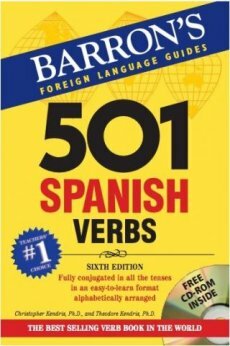 Fluency in Spanish starts with knowledge of verbs--and Barron’s 501 Spanish Verbs shows students and travelers exactly how to use the 501 most common and useful Spanish verbs in all 16 tenses and moods. Each verb is alphabetically listed in easy-to-follow chart form, one verb per page with its English translation. List of more than 2,100 Spanish verbs! Every verb on the list is related to a model verb that’s conjugated in the same way. В файле только 12 страниц из 736 с текстом. Перезалейте пожалуйста. Очень хорошая книга.